Billy James is a bagpiper based in Grantham, Lincolnshire. He was born to a family of pipers from County Tyrone, Northern Ireland. He started learning the bagpipes at the age of eleven and was taught by Pipe Major George Grant from the Argyll and Sutherland Highlanders. 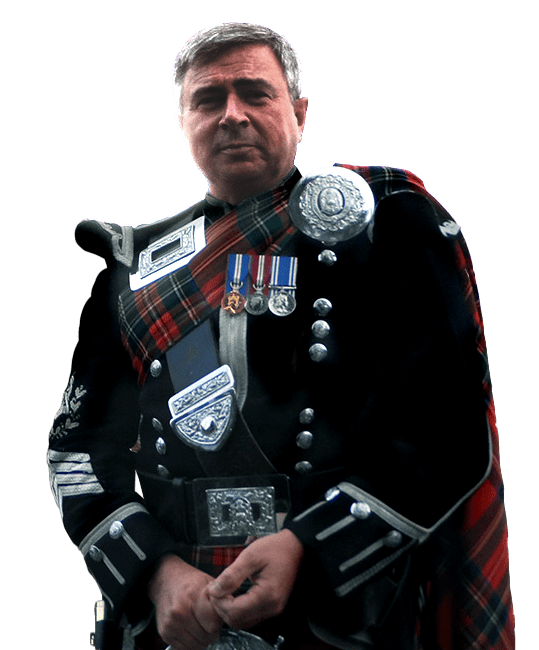 Billy began winning solo piping championships from the age of 16 and at the age of 20 became Pipe Major of the Mickleover Royal British Legion Pipe Band who won countless competitions. 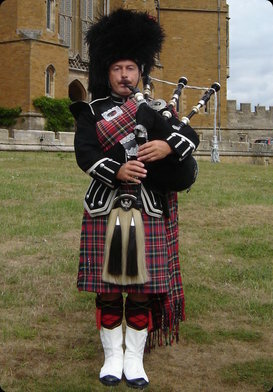 Billy spent thirty years piping for highland dancing championships throughout the world and during the last thirty five years Billy has been the family piper to Their Graces the Duke and Duchess of Rutland at Belvoir Castle, Leicestershire and has piped for many dignitaries including members of the British and overseas Royal Families. Billy has played for celebrities including Gareth Gates’ wedding. He has also been included in footage for American television programmes. In 2002 he played in the opening and closing ceremonies of the Ryder Cup at the Belfry. 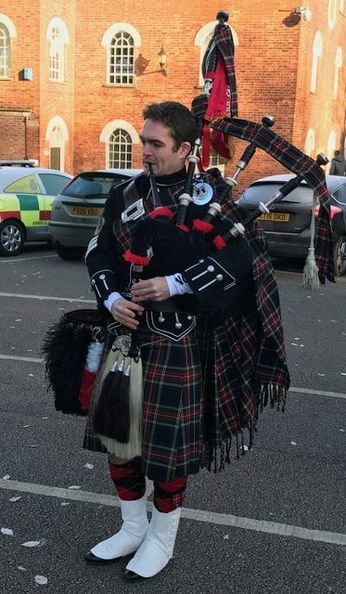 Billy currently plays and competes with the Nottingham Police Pipe Band Billy has forty year’s experience of piping at a wide range of public and private events including weddings, parties, funerals, Burns Suppers, and Hogmanay events. “A huge thank you to Billy for making my father’s 90th birthday party go with such a swing. My father loved the music. Billy had researched what my father would enjoy and it was a really emotional occasion for him. It made the party for him and all of us. “Billy was playing at my wedding yesterday. He is very professional, extremely talented and lovely to talk to. It was a surprise booking for my husband to play at our wedding, it remained a surprise and he was so shocked to hear the pipes as we walked out of the chapel. “Just wanted to say a big thanks for recommending Billy to play at my wedding, he was brilliant, lovely guy“. “We would just like to say a big thank you to Billy James for making our special day even more perfect. He looked smart and was a very genuinely nice man. We would highly recommend him to everyone. As my husband didn’t know we was having a piper, Billy James helped keep the surprise by keeping out of sight until piping me down the aisle. So again a massive thank you from us. “Firstly I would like to just point out that I am not one to leave comments and secondly I was hesitant to hire a Bagpiper from the internet…. But my word was Mr Bill James worth it!!! Having served with the Highlanders and being Scottish, with a lot of Scots attending my wedding. I originally asked friends within the Regiment to Pipe at my wife and my Wedding, Due to work related matters, they could not attend, which left us without a piper. 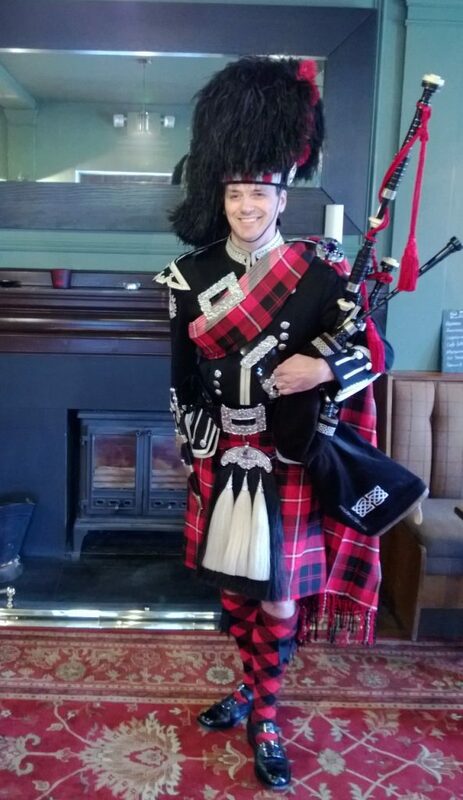 Searching the internet, I found a Piper, but again due to commitments, he too could not attend, but suggested Mr James. From the start, my wife, myself and our guests, were amazed. He was fantastic. His playing of the Pipes, I am afraid to say, would have put even some of the best within the Regiment to shame!!! The perfect manner in which he conducted the pipes and himself was world class! His presentation, friendly and very professional manner stood out! (He was even at the Church before me)!! Would I recommend Mr James….? YES…. I would strongly recommend the Gentleman!!! Without any hesitation I will be keeping his details for any further function or event that we have!!!!! Thank you very much Mr Bill James, you certainly completed our wedding! To that we are both grateful. Billy James played the bagpipe at our wedding in March this year, and really made our day. He was perfect, couldn’t have asked for a better piper! Extremely reliable, very professional, and very talented. His tartan even matched ours! I have no hesitation in recommending him for any events.